Setsuko Thurlow was a 13-year-old schoolgirl when the United States dropped an atomic bomb on her city, Hiroshima. Today, she is a leading figure in the International Campaign to Abolish Nuclear Weapons (ICAN). Her powerful speeches have inspired countless individuals around the world to take action for disarmament. She was instrumental in the creation of the landmark Treaty on the Prohibition of Nuclear Weapons, adopted in July 2017 with the support of 122 nations. For decades, she has warned governments that inaction is not an option: nuclear weapons must be totally eliminated if we are to ensure that no other city ever suffers the same fate as hers. Setsuko’s courageous advocacy, sharp analysis and deep conviction make her a formidable opponent to all who claim that these ultimate weapons of mass destruction are legitimate instruments of defence. A living witness to the horrors of nuclear war, she has contributed enormously to the success of ICAN over the past decade. In October 2007, Setsuko spoke at the Canadian launch of ICAN, organized by Physicians for Global Survival and other peace and anti-nuclear organizations. Having led global efforts to outlaw anti-personnel landmines in the 1990s, Canada was well placed to lead a diplomatic process to outlaw nuclear weapons, she said. As I was wiping my tears of joy in the din of the thunderous applause, I realized that the world has heard the voices of the hibakusha – the survivors of Hiroshima and Nagasaki – and is with us in solidarity for our urgent shared task of prohibiting and eliminating nuclear weapons for the sake of humanity. On 8 December 2017, Setsuko spoke in Vienna at the third major intergovernmental conference on the humanitarian impact of nuclear weapons, with diplomats from 158 nations present. Survivors of nuclear testing in various parts of the world also shared their first-hand testimonies on the inhumanity of nuclear weapons. Here in Vienna, let us move forward, courageously, by concretizing our vision so that we can make the 70th anniversary of the atomic bombing of Hiroshima and Nagasaki the appropriate milestone to achieve our goal: to prohibit and eliminate nuclear weapons. Let us start this process, beginning with negotiations on a ban treaty. At a UN working group meeting in Geneva in May 2016, Setsuko urged nations to agree to convene a conference in 2017 to conclude a treaty banning nuclear weapons. The working group’s report, issued in August 2016, led to the adoption of a historic UN General Assembly resolution establishing a mandate for negotiations. On 28 March 2017, the vast majority of the world’s nations began work on a treaty to prohibit nuclear weapons, bringing an end to more than two decades of paralysis in multilateral disarmament negotiations. Setsuko told delegates that she had no doubt that the treaty could – and would – “change the world”. I want you to feel the presence of not only the future generations, who will benefit from your negotiations to ban nuclear weapons, but to feel a cloud of witnesses from Hiroshima and Nagasaki. The memories and images of those who perished have always supported and guided me. I think this is how many survivors have kept on living – to make sure that the deaths of their loved ones were not in vain. On 7 July 2017, following weeks of intense negotiations, 122 nations voted to adopt the landmark Treaty on the Prohibition of Nuclear Weapons – establishing a categorical ban on the worst weapons of mass destruction. Setsuko received a standing ovation when she addressed diplomats in the closing session. I’ve been waiting for this day for seven decades. And I am overjoyed that it has finally arrived. This is the beginning of the end of nuclear weapons. To the leaders of countries across the world, I beseech you: if you love this planet, you will sign this treaty. Nuclear weapons have always been immoral. Now they are also illegal. Together, let us go forth and change the world. Born in Hiroshima on 3 January 1932, Setsuko Thurlow (maiden name: Nakamura) is the youngest of seven children. When the atomic bomb hit on 6 August 1945, killing more than 140,000 people, she was approximately 1.8 kilometres from the hypocentre. Eight of her family members and 351 of her schoolmates and teachers died in the attack. As an undergraduate, Setsuko studied English literature and education at Hiroshima Jogakuin University before moving to the United States, where she studied sociology at Lynchburg College in Virginia. In 1955, she married Canadian national Jim Thurlow, a historian, and together they set up their home in Toronto. Up until his death in 2011, Jim was Setsuko’s main supporter and confidant throughout more than half a century’s activism against nuclear weapons. He helped her to organize events and found various anti-nuclear groups. They had two children together and two grandchildren. Setsuko obtained a master’s degree in social work from the University of Toronto and had an illustrious career spanning two decades. In 2006, she was made a member of the Order of Canada for her outstanding contributions to social work and her tireless efforts to rid the world of nuclear weapons. Her anti-nuclear activism began in earnest in 1954, following the detonation of a hydrogen bomb code-named “Castle Bravo” at Bikini Atoll in the Marshall Islands, dispersing radioactive fallout far and wide. This US weapon was vastly more powerful than the one that had levelled her city a decade earlier. In 1974, deeply concerned that the public had started to forget about the devastating impact of the atomic bombings, Setsuko established the activist organization Hiroshima Nagasaki Relived. She worked with like-minded people – scholars, artists, lawyers and teachers – to educate and mobilize the public. Since then, she has travelled to dozens of countries to share her testimony of survival and alert people to the grave threat that nuclear weapons pose to all humanity, inspiring them to take action. She has been part of several global voyages of Peace Boat, a Japanese ocean liner that actively promotes nuclear disarmament. Her many speeches at the United Nations have brought diplomats to tears and strengthened their personal resolve to eliminate the nuclear menace. Her many presentations at schools, as part of the New York-based Hibakusha Stories project, have had a profound impact on the lives of thousands of students. For her work to achieve a more peaceful and just world, she has received numerous honours, including the Queen Elizabeth II Diamond Jubilee Award in 2012. The city of Hiroshima designated her a “peace ambassador” in 2014, and the Arms Control Association named her “arms control person of the year” for 2015. On 6 October 2017, the Norwegian Nobel committee announced that ICAN had won the Nobel Peace Prize “for its work to draw attention to the catastrophic humanitarian consequences of any use of nuclear weapons and for its ground-breaking efforts to achieve a treaty-based prohibition of such weapons”. Setsuko watched the announcement live at her home in Toronto and was elated by the news. She said that she was deeply honoured and humbled to be invited by ICAN’s international steering group to accept the prize in Oslo on 10 December on behalf of the campaign, together with ICAN’s executive director, Beatrice Fihn. I was simply overjoyed by the news. What a wonderful and well-deserved honour. It has been such a privilege to work with so many passionate and inspirational ICAN campaigners around the world over the past decade. The Nobel Peace Prize is a powerful tool that we can now use to advance our cause, especially in countries that have so far refused to join the nuclear weapons ban treaty. I pledge, to my last breath, to dedicate my life to nuclear disarmament. As a 13-year-old schoolgirl, I witnessed my city of Hiroshima blinded by the flash, flattened by the hurricane-like blast, burned in the heat of 4,000 degrees Celsius and contaminated by the radiation of one atomic bomb. A bright summer morning turned to dark twilight, with smoke and dust rising in the mushroom cloud, dead and injured covering the ground, begging desperately for water and receiving no medical care at all. The spreading firestorm and the foul stench of burned flesh filled the air. Miraculously, I was rescued from the rubble of a collapsed building, about 1.8 kilometres from ground zero. Most of my classmates in the same room were burned alive. I can still hear their voices calling their mothers and God for help. As I escaped with two other surviving girls, we saw a procession of ghostly figures slowly shuffling from the centre of the city. Grotesquely wounded people, whose clothes were tattered, or who were made naked by the blast. They were bleeding, burned, blackened and swollen. Parts of their bodies were missing, flesh and skin hanging from their bones, some with their eyeballs hanging in their hands, and some with their stomachs burst open, with their intestines hanging out. Within that single flash of light, my beloved Hiroshima became a place of desolation, with heaps of rubble, skeletons and blackened corpses everywhere. Of a population of 360,000 – largely non-combatant women, children and elderly – most became victims of the indiscriminate massacre of the atomic bombing. As of now, over 250,000 victims have perished in Hiroshima from the effects of the blast, heat and radiation. Today, seven decades later, people are still dying from the delayed effects of one atomic bomb considered crude by today’s standard for mass destruction. Through months and years of struggle for survival, rebuilding lives out of the ashes, we hibakusha, or survivors, became convinced that no human being should ever have to repeat our experience of the inhumane, immoral and cruel atomic bombing. Our mission is to warn the world about the reality of the nuclear threat and to help people understand the illegality and ultimate evil of nuclear weapons. We believe that humanity and nuclear weapons cannot coexist indefinitely. Thus, we have a moral imperative to abolish nuclear arsenals, in order to ensure a safe, clean and just world for future generations. With this conviction, we have been speaking out around the world for the past several decades for the total abolition of nuclear weapons. Yet, hibakusha are increasingly frustrated by the lack of tangible progress toward nuclear disarmament. This, in spite of our baring our souls with painful memories over the past seven decades to warn people about the hell on earth we experienced in Hiroshima and Nagasaki. Setsuko speaks on 28 March 2017 in New York during the first round of negotiations that led to the adoption of the historic UN nuclear weapon ban treaty. 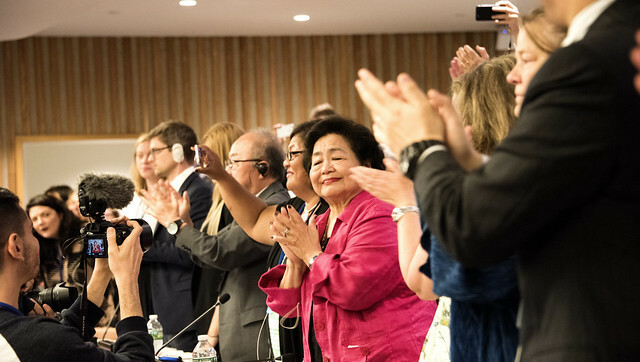 Setsuko speaks on 7 July 2017 in New York following a historic vote – 122 nations to one – to adopt the Treaty on the Prohibition of Nuclear Weapons.